Inflammatory myofibroblastic tumor is a rare benign lesion found mostly in children and young adults. It originates from the lung, abdominopelvic region, and retroperitoneum. The tumor is composed of myofibroblasts and inflammatory cell infiltration in the tissue. The cause and pathogenesis of this tumor are not completely understood. Epstein-Barr virus has been held responsible in some reported cases of inflammatory myofibroblastic tumors. Another tumor (which is known to be related to the Epstein-Barr virus) is posttransplant lymphoproliferative disorder. We report the case of a 2-year-old boy who underwent a liver transplant at the age of 9 months (the donor was his mother) because of biliary atresia. At 11 months after transplant, we detected posttransplant lymphoproliferative disorder and inflammatory myofibroblastic tumor concurrently. This entity is presented to highlight possible Epstein-Barr virus involvement in inflammatory myofibroblastic tumor of lung. Inflammatory myofibroblastic tumor (IMT) is a rare benign tumor, accounting for 0.7% of all lung tumors. The tumor occurs most commonly in children and young adults, and its cause is not completely understood.1,2 Epstein-Barr virus (EBV) has been held responsible in some reported cases of IMT.1-3 Another tumor (which was known to be related with EBV) is posttransplant lymphoproliferative disorder (PTLD). We report a case of a 2-year-old boy who underwent a liver transplant 1 year earlier who presented with posttransplant lymphoproliferative disease and inflammatory myofibroblastic tumor involving the lungs. We report the case of a 2-year old boy, referred to the Transplant Department at Başkent University of Ankara, Turkey, with biliary atresia and jaundice since birth. On admission to our hospital, at the age of 3 months, he underwent an ineffective Kasai portoenterostomy procedure. At the time of presentation, he had vomiting and diarrhea, and hepatosplenomegaly and cirrhosis were detected on his physical and ultrasonographic examinations. At our institution, he received a left lateral segment liver transplant at 9 months of age from his mother, who was 23 years old at the time. The boy was started on tacrolimus-based immunosuppression. At 7 months after surgery, he presented with fever and cryptic tonsillitis. He was evaluated for EBV infection. The laboratory results were negative for EBV immunoglobulin M, EBV immunoglobulin G, and negative polymerase chain reaction. Four months later, when he presented with longstanding diarrhea, an upper gastrointestinal system endoscopy and colonoscopy were performed, and ulcerations with malign appearance were seen in his antrum and colon. Endoscopic biopsies were taken, and the histologic diagnosis was posttransplant lymphoproliferative disorder, monomorphic type. Neoplastic cells were large, transformed, blastic cells with prominent nucleoli and basophilic cytoplasm (Figure 1A). B-cell origin of the tumor was detected by immunohistochemistry with CD 20 (Figure 1A, inset). Expression of EBV-encoded RNA (EBER) was found to be positive in the tumor cells (Figure 1B). At this time (4 months later), repetitive EBV polymerase chain reaction results were positive as 6.7 × 105 copies/mL. He began receiving chemotherapy, including cyclophosphamide. Because he had a fever and cough at the time of second chemotherapy, a computed tomographic scan of the chest was performed, showing a subpleural solid lung mass, measuring 3.5 cm, with irregular borders in the left inferior lobe. A transthoracic biopsy was performed, and the histologic diagnosis was inflammatory pseudotumor of the lung. After 6 months, a left inferior lobectomy was performed. 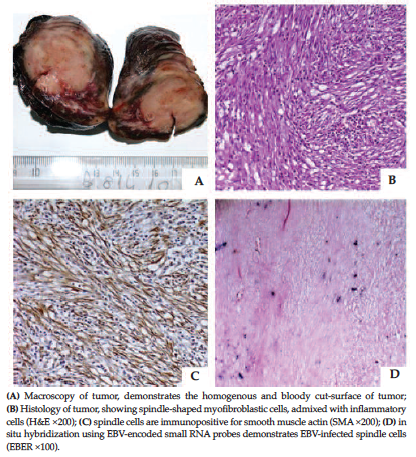 Macroscopically, a yellowish mass, measuring 4.8 × 3.9 × 3.2 cm was seen, and the cut surface of the tumor showed a grayish homogenous appearance (Figure 2A). The lumen of inferior bronchus and artery were completely infiltrated by the tumor. Microscopically, the tumor showed a cellular mass consisting of interlacing fascicles of spindle cells, admixed with inflammatory cells containing lymphocytes, plasma cells, and eosinophils (Figure 2B). There was no atypia. Immunohistochemical analyses showed positive staining of spindle-shaped tumor cells for smooth muscle actin (Figure 2C), H-caldesmon, and no staining with S-100 and CD 34. In situ hybridization for EBV was performed using a cocktail of EBV-encoded small RNA probes labeled with fluorescein conjugate in a formamide-based diluent (Inform EBER; Ventana, Tucson, AZ, USA) and the expression of EBV-encoded RNA (EBER) was found as positive in spindle-shaped tumor cells (Figure 2D). Based on these features, the diagnosis of inflammatory myofibroblastic tumor was retained. The child has remained well during 5 years of follow-up with no evidence of recurrence both of PTLD and inflammatory myofibroblastic tumor. Inflammatory myofibroblastic tumor of the lung is a rare benign lesion occurring mostly in children.1 It was first described by Brunn in 1939.2 Inflammatory myofibroblastic tumors most commonly involve the lung, but they have been reported to occur in other areas including the orbit, the retroperitoneum, the gastrointestinal tract, the mediastinum, and the central nervous system. It is also known as plasma cell granuloma, inflammatory pseudotumor, histio-cytoma, or fibroxanthoma. Although the incidence of IMT reported in the literature is < 1% of all lung masses, it is the most common primary lung tumor in childhood, with a reported incidence of 57%.1,2 Clinical presentation and radiologic findings vary and nonspecific. The most common clinical manifestation is cough, often accompanied by dyspnea, hemoptysis, and fever. Diagnostic confirmation is based on histologic examination. Histopathologically, it is a benign solid tumor composed mainly of spindle-shaped cells, and it has a chronic inflammatory component consisting of plasma cells, lymphocytes, eosinophils, and occasional histiocytes. Epstein-Barr virus has been implicated in several human neoplasms, including Burkitt lymphoma, Hodgkin and non-Hodgkin lymphoma, nasopharyngeal carcinoma, gastric carcinoma, EBV-associated smooth muscle tumors and with PTLD. In hematopoietic neoplasms, tumorigenesis is related to latent infection of B lymphocytes with subsequent activation.5 Posttransplant lymphoproliferative disorders are heterogeneous lymphoid disorAers ranging from indolent polyclonal proliferations to aggressive lymphomas that complicate solid-organ or hematopoietic transplant.6 Historically, most cases of PTLD among these patients occur within the first year from transplant. Most cases are B-cell origin and are associated with EBV infection.6 As in the literature, in our case, PTLD occurred 11 months after liver transplant, the tumor was B-cell origin, and EBV was positive. In our case, the IMT was detected in the lung almost 1 year after the liver transplant in a 2-year-old boy, and EBV positivity was noted in the spindle-shaped tumor cells. The most important differential diagnosis in our case was made from EBV-associated smooth muscle tumors. Epstein-Barr virus-associated smooth muscle tumors are rare neoplasms that occur in immunocompromised patients, particularly in the pediatric AIDS population.15 They are usually multicentric and exhibit a predilection for unusual sites, including the liver, lungs, the heart, the spleen, or the gastrointestinal tract. Their biological behavior and clinical course vary from benign to aggressive. These tumors contain 2 cell populations composed of well-differentiated spindled smooth muscle cells with brightly eosinophilic cytoplasm, arranged in short fascicles and oval-to-round cells forming distinct nodules.15 Mild-to-severe atypia may be seen. There may be few lymphocytes between the tumor cells and EBER positivity is essential for diagnosis.15 In our case, a solid tumor composed of interlacing fascicles of spindle cells without atypia, admixed with lymphocytes, plasma cells, and eosinophils were detected, which is not a known integral feature of the smooth muscle tumor. We report a rare case of concurrent PTLD and pulmonary IMT in a pediatric transplant patient. Both these tumors may be caused by EBV. Our case proves the cause of these tumors, because these tumors were seen back-to-back in this patient. Hammas N, Chbani L, Rami M, et al. A rare tumor of the lung: inflammatory myofibroblastic tumor. Diagn Pathol. 2012;7:83. doi: 10.1186/1746-1596-7-83. Brunn H. Two interesting benign tumors of contradictory histopathology: remarks on the necessity for maintaining the chest tumor registry. J Thorac Surg. 1939;9:119-131. Oz Puyan F, Bilgi S, Unlu E, et al. Inflammatory pseudotumor of the spleen with EBV positivity: report of a case. Eur J Haematol. 2004;72(4):285-291. Rosenbaum L, Fekrazad MH, Rabinowitz I, Vasef MA. Epstein-Barr virus-associated inflammatory pseudotumor of the spleen: report of two cases and review of the literature. J Hematop. 2009;2(2):127-131. doi: 10.1007/s12308-009-0030-3. Thompson MP, Kurzrock R. Epstein-Barr virus and cancer. Clin Cancer Res. 2004;10(3):803-821. Wistinghausen B, Gross TG, Bollard C. Post-transplant lymphoproliferative disease in pediatric solid organ transplant recipients. Pediatr Hematol Oncol. 2013;30(6):520-531. doi: 10.3109/08880018.2013.798844. Arber DA, Kamel OW, van de Rijn M, et al. Frequent presence of the Epstein-Barr virus in inflammatory pseudotumor. Hum Pathol. 1995;26(10):1093-1098. Neuhauser TS, Derringer GA, Thompson LD, et al. Splenic inflammatory myofibroblastic tumor (inflammatory pseudotumor): a clinicopathologic and immunophenotypic study of 12 cases. Arch Pathol Lab Med. 2001;125(3):379-385. Mergan F, Jaubert F, Sauvat F, et al. Inflammatory myofibroblastic tumor in children: clinical review with anaplastic lymphoma kinase, Epstein-Barr virus, and human herpesvirus 8 detection analysis. J Pediatr Surg. 2005;40(10):1581-1586. Lykavieris P, Fabre M, Waguet J, Bernard O. Inflammatory pseudotumor after liver transplantation. J Pediatr Gastroenterol Nutr. 2000;31(3):309-312. Harel Z, Perl J, Herzenberg AM, Bargman JM. Inflammatory pseudotumor of the kidney allograft. Am J Kidney Dis. 2009;54(3):533-537. doi: 10.1053/j.ajkd.2009.01.272. Remberger K, Weiss M, Gokel JM, Landgraf R, Illner WD, Land W. Inflammatory pseudotumor of the pancreas with persistent hyper-insulinemia and hypoglycemia following long-term pancreatic transplantation [in German]. Verh Dtsch Ges Pathol. 1987;71:328-332. Lykavieris P, Fabre M, Pariente D, Lezeau YM, Debray D. Clostridium difficile colitis associated with inflammatory pseudotumor in a liver transplant recipient. Pediatr Transplant. 2003;7(1):76-79. Huang YH, Zhong DJ, Tang J, et al. Inflammatory myofibroblastic tumor of the liver following renal transplantation. Ren Fail. 2012;34(6):789-791. doi: 10.3109/0886022X.2012.673446. Deyrup AT, Lee VK, Hill CE, et al. Epstein-Barr virus-associated smooth muscle tumors are distinctive mesenchymal tumors reflecting multiple infection events: a clinicopathologic and molecular analysis of 29 tumors from 19 patients. Am J Surg Pathol. 2006;30(1):75-82. Acknowledgements: The authors have no conflicts of interest to disclose, and there was no funding for the study.